This challenge was made a lot harder by the fact that I am currently cut off from the majority of my books (see this post for explanation). I had a very limited selection to choose from, so the color I'm going with is "whitish." That's the best I could do! Hard to believe, but I actually met all of my goals. It's amazing how much reading you can squeeze in if you make it a priority. If only I had this excuse to read during every spare moment every week! Today's (Tuesday's) challenge was hard! I skipped it too. Good luck. Maybe you can write a Haiku today? I did not. Sometimes it's hard to do the challenges. 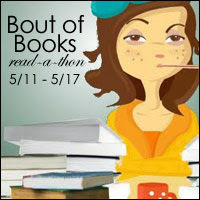 While I have more reading time this week than usual, I will not have internet access for the next 4 days. I will be technology free! It feels weird. Again, good luck and I hope you get more reading time than you think you will!